When I was pregnant with Caelan, we started doing some research and looking into finding daycare for him. We originally looked at centers because I thought we’d be most comfortable having him in a structured environment. Due mostly to the astronomical cost of daycare centers in our area, we started looking into home daycares. I must admit that I didn’t go into the experience with a good attitude. I never thought I’d be comfortable leaving my child at some stranger’s house. We interviewed several providers and pretty much from the moment we set foot in Miss S’s daycare room, we were sold. She had her basement converted into what looked like a daycare center. There was a row of high chairs for the babies and a child-sized table and chairs for the toddlers. Swings, bouncers, toys, and even a small kitchen area. There was a separate nap room with a closed-circuit feed so that she could keep an eye on the nappers while in the bigger play room. Perfect. Caelan has been going there 5 days a week since he was 10 weeks old. Miss S is the person he’s spent the most time with in his whole life (aside from Bill and me) and he loves her and is very comfortable with her (more on that in a sec!). Miss S has had a couple of assistants and Caelan knows and loves them as well. We couldn’t have asked for a better daycare provider for our kids (Leah started there when she was 10 weeks old also). I didn’t realize when we were first looking for daycare what a huge benefit it would be to have our child in an environment with other children of varying ages. In a center, he would have been with kids his own age, but at Miss S’s he got exposed to all ages. He got knocked down by the big kids when he was following them around and he learned to be gentle with the babies. When the older kids at Miss S’s left for preschool and Caelan became the “big kid”, things started to go downhill. He was as comfortable there as he was at home and he started to take advantage. 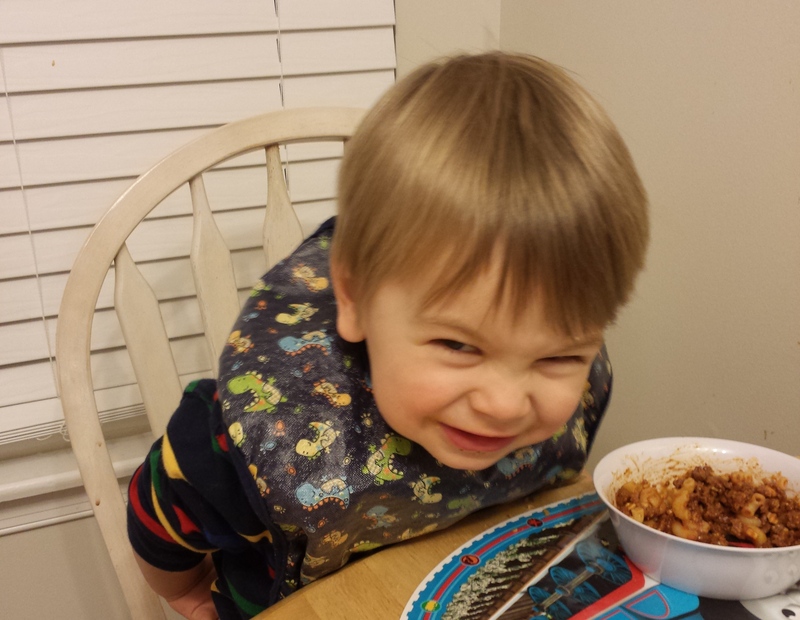 He acted out, as 2-year-olds do, but we started to think that maybe it was time for a change. 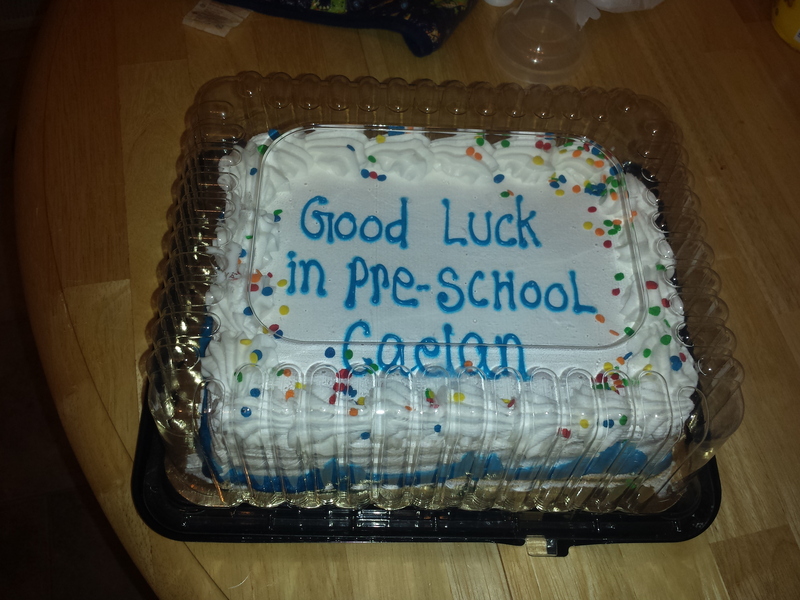 We always thought we’d move Caelan to a preschool once he was older. 3? 4? We weren’t sure exactly when, but we wanted him to be in a classroom environment before he started kindergarten. Suddenly it was clear that he was ready for a move now, before his 3rd birthday. He’s very smart, he has excellent language skills and he really needs to be in an environment with kids his own age or older. That, and his behavior was getting a little out of control. So we took the plunge and enrolled him in a local preschool. Today is his last day at Miss S’s and he’ll start in preschool on Monday. It’s very bittersweet. We’ve been talking it up with him, trying to get him excited about it. We’ve driven by the new school and looked at the playground. He picked out a Lightning McQueen lunch box and I got him a pillow and blanket to match for nap time. He repeats what we’ve told him about making new friends, learning to use the potty, and being a big boy but I don’t think he’s realized yet that he won’t be going back to Miss S’s. We’ll still see her of course, because Leah will continue to go there until she’s ready for preschool. But Caelan will be leaving his friends at Miss S’s and soon they’ll be moving on to preschool themselves – a different preschool, unfortunately, but maybe they’ll all meet up in kindergarten, who knows! Bill and I are happy and sad and excited and nervous for Caelan as he takes this big step (or as we give him this big push??). I hope the transition is smooth. Wish him (us) luck!! Despite the “terrible 2’s” and upcoming “shoot me in the face 3’s”, we’ll keep Caelan around because of stuff like this! CAELAN: Do you want me to stay a few minutes? CAELAN: Next time we’ll go to the zoo. And probably there will be a lion there. A big one. And a rooster. And a kitty cat. CAELAN: I want a special treat! I want an egg and a newspaper and a foot! BILL: I have a headache. CAELAN: Where does it hurt Daddy? BILL [pointing to his head]: Right here. CAELAN: Is it better now? BILL: No, it still hurts. Caelan kisses Bill’s forehead again. CAELAN: Now is it better? You are currently browsing the Decorate This blog archives for March, 2014.